Josh Hanagarne couldn't be invisible if he tried. Although he wouldn't officially be diagnosed with Tourette Syndrome until his freshman year of high school, Josh was six years old and onstage in a school Thanksgiving play when he first began exhibiting symptoms. By the time he was twenty, the young Mormon had reached his towering adult height of 6'7" when--while serving on a mission for the Church of Latter Day Saints--his Tourette's tics escalated to nightmarish levels. Determined to conquer his affliction, Josh underwent everything from quack remedies to lethargy-inducing drug regimes to Botox injections that paralyzed his vocal cords and left him voiceless for three years. Undeterred, Josh persevered to marry and earn a degree in Library Science. At last, an eccentric, autistic strongman--and former Air Force Tech Sergeant and guard at an Iraqi prison--taught Josh how to "throttle" his tics into submission through strength-training. Today, Josh is a librarian in the main branch of Salt Lake City's public library and founder of a popular blog about books and weight lifting--and the proud father of four-year-old Max, who has already started to show his own symptoms of Tourette's. "The World's Strongest Librarian" illuminates the mysteries of this little-understood disorder, as well as the very different worlds of strongman training and modern libraries. With humor and candor, this unlikely hero traces his journey to overcome his disability-- and navigate his wavering Mormon faith--to find love and create a life worth living. "Wildly quirky memoir of facing down his ferocious Tourette's tics...Hanagarne's account manages to be very gag-full and tongue-in-cheek...highly engaging...Reconciled with Tourette's, Hanagarne never let the disease get the upper hand." "A sumptuous read, as funny, erudite, and energizing as a chat with a conversational intellectual, as engrossing and moving as a medical detective drama... The book leaves all of us who've read it feeling a little stronger and brighter ourselves." --Martha Beck, Author of "Expecting Adam, Leaving the Saints, "and" Finding Your Way in a Wild New World"
"Just like the library has every funny, beautiful, moving, wise story you'd ever need in it, so too does this book. This is not just your ordinary memoir: it is a soaring, inspiring elegy to the small and big miracles of parenthood and friendship and marriage and how they triumph over the not so small challenges of life. It is a perfect, perfect gem of a read, unputdownable, unforgettable, unmatchable." --Pam Allyn, author of "What to Read When"
"Josh Hanagarne inspires in his pursuit to break the shackles of Tourette Syndrome and live his life to the fullest, as a husband, a father and a librarian. 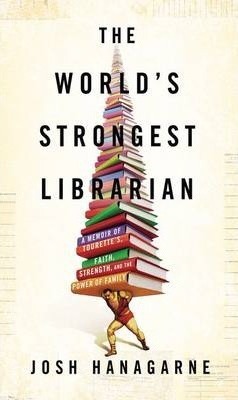 Insightful, heart-wrenching and delightfully humorous, "The World's Strongest Librarian" is a triumph!" --Cory MacLauchlin, author of "Butterfly In The Typewriter: The Tragic Life of John Kennedy Toole and The Remarkable Story of A Confederacy of Dunces." "As a gym rat myself, I can attest to the power of hurling one's sinews against heavy stuff that keeps wanting to slam you back into the floor. The difference with Josh Hanagarne is he has lifted much weightier impediments--Tourette's, loneliness, geekitude, and the calling to be a writer. That he is, and a talent to savor, to emulate, and to be inspired by." --Steven Pressfield, bestselling author of "The War of Art "and" Turning Pro"